For more than 15 years, the Passover Project has sent rabbinic students from Hebrew Union College – Jewish Institute of Religion to Reform congregations across Russia, Ukraine and Belarus to lead Passover celebrations. Every year, students join growing congregations for traditional and innovative programs and services designed to bolster the communities. Nowadays, the students have as much to learn from the regional congregations and rabbis about leadership and Jewish programming and education as they do to contribute. This year, in Belarus, more than 1,500 participants came together for Passover under the leadership of: Rabbi Grigory Abramovich, Jewish Educator Irina Belskaya, Chairs of the Minsk communities Simha, Sheket and Tamar, and leaders of the congregations in Baranovichi, Vitebsk, Gomel, Mogilev; together with six rabbinic students from HUC-JIR: Michelle Blumenthal, Tammy Cohen, Rachel Rothstein, Sam Rosen, Jenna Mark, Jason Morrison. Representatives of the Joint Distribution Committee (JDC) also joined the rabbinic students and Rabbi Grigory Abramovich for a special seder held for six of the Jewish youth organizations in Minsk. Following tradition, for the 14th year, the students joined local cantors to participate in the International Cantorial Festival at the Sandra Breslauer Beit Simha Center in Minsk. The joyous and moving festival was directed by Irina Abramovich. Students also visited the kindergarten of the Gomel School Atikva. It was the 7th visit by HUC students to the school and, as the children learned and sang Passover songs, the event was meaningful for all. The Seder of the seventh day was led by Rabbi Grigory Abramovich in the city of Borisov within the frameworks of the state-run project “Year of the Little Homeland”. During Passover Chol ha Moed a youth Seder was led by Albert Kengerli. Members of Minsk Netzer joined rabbinic students in singing songs of the holiday and studying midrash for the holiday. Excerpts from the celebration in Beit Simha, with Chair Andrey Dorofeev and Sheket Chair Lyudmila Chertova, will be used in a video about the Belarusian religious communities. 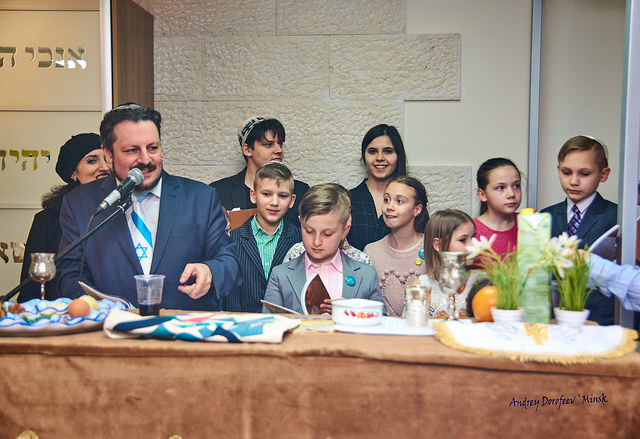 Bnei Mitzvah students in Mogilev and Vitebsk communities, led by Mila Izakson and Dmitry Rudnitsky, were actively involved in their community Seder activities. Natalia Malets from JDC initiated the students’ participation in the Seder for professional staff of the Minsk Jewish Community Center, together with the Jewish Museum Director and Director of Hesed Rahamim, the club for the elderly people. Rabbinic students also led English lessons in Minsk State Gymnasium 32, an initiative of Rabbi Abramovich and Natalia Halaburda. The students noted that this was the most eventful and interesting aspect of their Seders and brought great meaning to their overall experience. The staff of the RUPJ in Belarus, community leaders and program managers are grateful to the Rita Feizer (Fruman), Director of FSU Programs and Operations at the World Union and all her colleagues in the Jerusalem office, as well as to the Hebrew Union College – Jewish Institute of Religion for their support of the Pesach Project and its. “It’s not just a project, it’s a framework for the growth and success of our movement,” added Rabbi Grigory Abramovich. 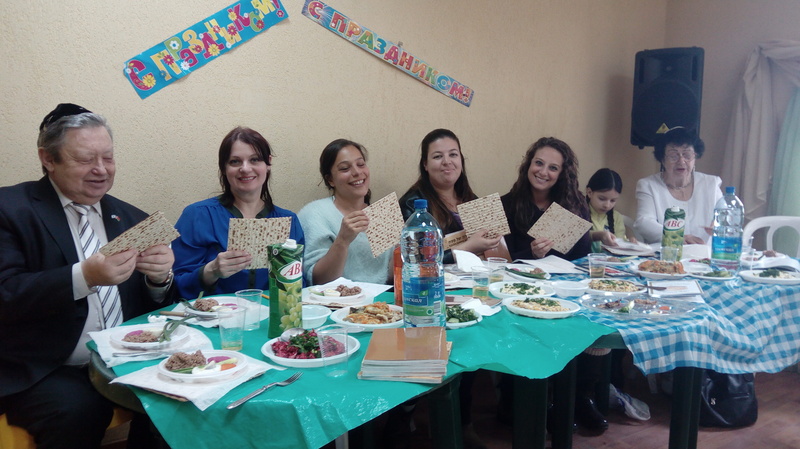 Please fill out this form to share "[Belarus] The Pesach (Passover) Project: Rabbinic Students Join Growing Congregations for Passover" via e-mail.